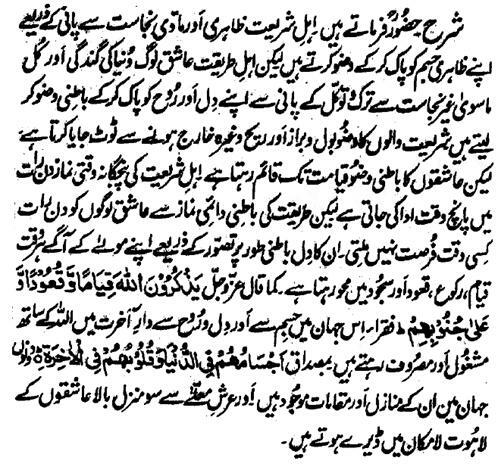 Hazrat Sultan Bahu Rahmatu-Allahe Ta-aala Alaihe says that 'the People of Shariyat make their physical body Pure against the Outwardly and Material Impurity by Ablution (Wuzu) with water but the People of Tareeqat do Inwardly Ablution through the water of the Tark and Tawakul to clean the Impurity of Dunya (World) and all that which is besides Allah. Ablution (Wuzu) of the People of Shariyat become invalid by urination and excretion of solid wastes and fart but the Ablution of the Aashiqeen remains intact till the Day of Resurrection. 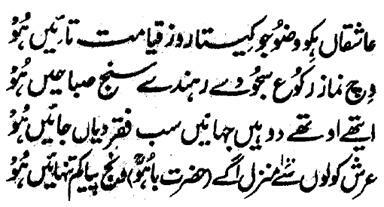 Five Times Assalaat (Prayers) offered by the People of Shariyat is only periodic for five times a day but the Inwardly Assalaat (Prayers) of the Tareeqat is Unremitting (infinite) in which the Aashiqeen are all the time busy day and night. Their heart remains all the time Standing, Bowing and Prostrating Postures day and night Inwardly before their Lord through Visualization. 'their bodies are in world and their hearts are in the Hereafter'. Their Destinations and Stations are present in Both-the-Worlds and hundred destinations above the Arsh e Mualla, the Aashiqeen have stations in the Lahoot Lamakaan.